Though I got some work done on the governmental form for my story’s featured city, an important piece of the plot, I did not write as much as I wish I could have. One of our dogs slipped out the gate when my back was turned and I didn’t notice she was gone for about 30 minutes. By that time, being a runner, she could have been half way across town. I searched, by car and on foot, but I knew after the first “Bella, come!” and no dog showed it was a fools errand. We’ve just moved and she’s only been on a few walks. I doubt she’s imprinted on “home” yet. This is where a lot of bloggers apologize for having been gone for so long from their boards. I’m not going to do that as I’m reasonably assured no one has been pinning away due to a lack of my oh, so witty repartee! I mean, honestly, at this stage in my writing adventure, my blog is little more than a message-in-a-bottle meant to help me feel (as illusionary as that might be) that I’m part of a larger community of unpublished writers rather than due to any delusions concerning an eager audience. Somehow, the act of posting, trusting to the Fates and tossing it out into the cyberspace sea, is a comforting one. The illusion is enough and at this stage, I ask no more of it. Due to the madness that is part and parcel of a high school English teacher’s typical Friday, as well as the fact that I have no inspiring story calling out to me, I did not make my word count goal for the day. I’m not too surprised, nor am I unduly worried. Today is a Saturday. My wife is at work and I and the dogs have nearly all morning to write. Still, write what? is the question. As November approached, I reflected on what I’d done in the past. 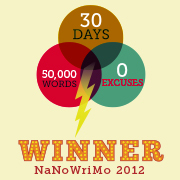 I had successfully completed four WriMos, two of which were NaNoWriMos. I had proven several times over then that I could both reach 50k and sustain a story idea that could use at least that many words. What had yet to be accomplished was a fully finished first draft, something I could proceed to revise and refine. 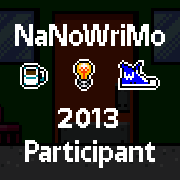 Thus, I decided this year’s NaNoWriMo strategy needed to be a bit different. I would not start a new manuscript and write another 50k that would in all likelihood end up simply being another unfinished story. 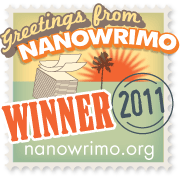 What I needed to do was rebel and make this NaNoWriMo experience a bit more utilitarian. I decided I had several options. A.) I could write 60 30-word Holly Lyle “Sentences”. Though it would most definitely not result in 50k, it could subject my right-brain muse to just the right exercise to identify a story idea about which I was passionate. B.) I could review my unfinished manuscripts and write up 30 in depth character profiles, each about 1,500+ words long. This was a win-win idea considering that if I did, I would easily have 50k, but also, knowing my twisted mind as I do, it most likely would lead to jump-starting an old story or conjuring up a new one long before the 30th profile was reached. C.) I could do 50k of world-building. Presently I have multiple on-going projects. I could easily crank out the required wordage and end up with something concrete for both my gaming and writing worlds. 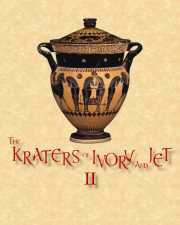 Tomorrow then, should see me beginning the 04:00-cycle and working on The Kraters of Ivory and Jet II. Okay…I bought the domain name, opted for under-the-radar personals, trash-canned the ads and signed up for custom design. It’s going to take me some time to get things straightened out. I don’t particularly like the theme I had to go with, some of the options and their limits pisses me off, but until I can get a handle on CSS, I’ll deal with it. I hope you’ll be patient with me. Ravven, hun, comment away you red headed, creative writing, gaming goddess artist. Sorry ’bout the Blogger BS. 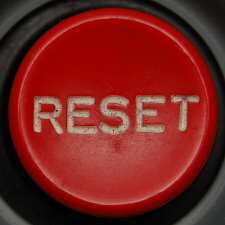 I knew this day was coming for a long time now and should have just bit the proverbial bullet and started the process. What is even more insane is that I knew better: I have three other WordPress blogs for my other subjects and interests and, wait for it…here’s the head-shaker…the early posts for TSQ were orginally written for a WordPress site! I don’t know what possessed me to go to Blogger in the first place! The look? The easier clickity to change font colors, etc.? I was too lazy to figure it out on WordPress? I dunno, maybe– Hey wait a minute…my kids…yeah…one of ’em’s got a Blogger site…I can blame them. I arrived at the Queen Bean a bit nervous. It had started some hours earlier and I as late. Because I’d gotten home late from work I’d barely had time to warm up my fingers before my bagpipe lesson with Aaron Shaw of the Wicked Tinkers (Awesome lesson, by the way! ), and I had yet to eat, I almost talked myself out of attending and if Marirose had been home, I probably would not have gone as with her schedule I do not get to spend a lot of time with her, but as it was the house was pretty quiet. 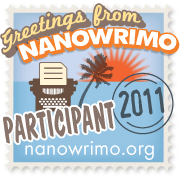 Besides, the NaNoWriMo and cool get togethers of like-minded and writing crazy individuals because of it, only happen once a year. Just dooo-it, I told myself. I went in to grab a bite before I sat down, but unfortunately the Queen had stopped serving meals much earlier. Bummer. As it was 19:30 and I had not eaten since noon, I was hungry. I turned around and headed back to the car with Japanese food on my mind. As I left however, I saw three folk in the corner with their laptops open going for it and figured they were the NaNo contingent, but as they were pretty focused, I didn’t hail them. After a delicious meal of sushi, miso soup and gyoza at Tokyo Express on J st., I returned to the Queen Been for a cup of Jo and introduced myself to the two remaining NaNo. I recognized one from a forum pic on the Modesto Meet Up site. I sat down, opened up my lap top and had only written a line or two when the barriesta told a customer the café would be closing in about a half an hour. I smiled to myself ruefully, chuckling at how the night had gone so far. I just shook my head and did my best. My new NaNo-friends were having a discussion about various books, fan-fiction, a new spin on Vampires and their own writing goals. I simply listened and tried to key at the same time. The acting “ML” suggested a word sprint type game in which we randomly drew popsicle sticks pre-marked with a word count—150, 250, 300, etc. (I drew 450) and tried to reach that mark in 15 minutes. The winner was awarded a chocolate. We only got about two thirds of the way through the sprint when, to our disappointment, the barriesta announced that the Queen Bean would be closing shortly! We thought we’d be there until 22:00, but it seems they closed an hour earlier than we’d been led to believe on their Facebook site. All in all, though I was only there for a short time, it was fun and a foretaste of the larger Write-In at Panera Bread in Turlock on Sunday. I have to say, that I enjoyed the intimate atmosphere of Queen Bean and look forward to meeting there again. 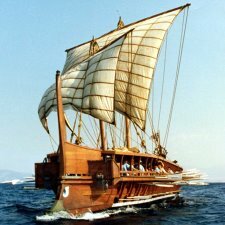 He paused on the stone wharf and looked hard at the bireme. Its crew busy taking on supplies. He readjusted the weight of his writing satchel on his shoulder and felt the weight of his years on his heart. He watched as the last of the cargo was loaded aboard. I must make the journey, he thought. I must write my story, but I cannot do it with one foot on the land and the other in the sea. I must either travel to the furthest shore…or stay here forever listening to the tales others weave with no hope of telling my own or, worse, re-hashing over and over the whys and wherefores I do not do what I wish to do. Believing my own lies adn exuces. (indent)“Are you coming or are you staying?” KurTdinovanis called across to him from the fighting deck. Some of the crew, ready to castoff, were paused watching him. (indent) “It would be easy to stay; it will be hard to go,” smiled the Tyrese merchant prince knowingly. (indent) “I’m coming with you,” he said. The crew cheered and the merchant captain smiled, his white teeth flashing. With a last look at the city, the quill-driver walked across the gang plank. (indent) “I will try one more time to bring us to the hither shore,” he said, pulling his pilots’ notebook from his bag. As I have planned the story will begin with a chariot race and end with one, but the horses will be going no where unless I begin myself.